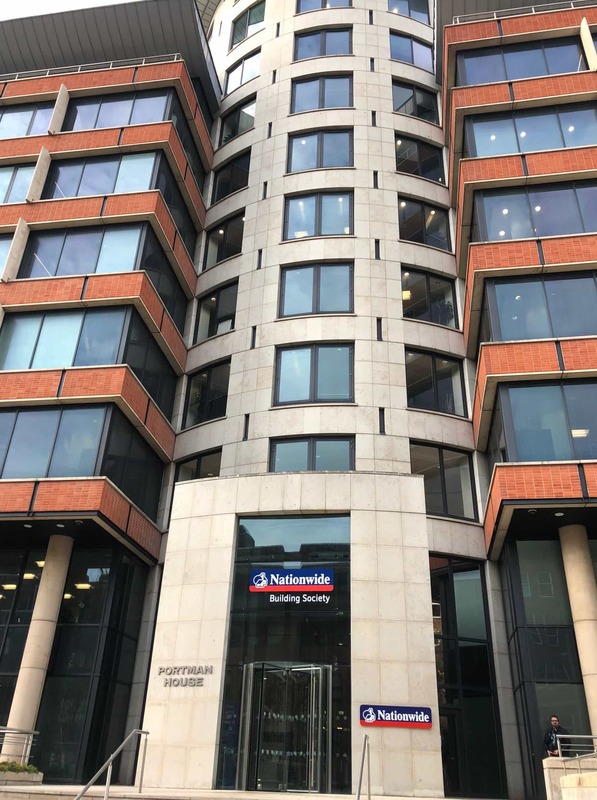 This is a great example of a commercial floor we were asked to maintain recently for the Bournemouth branch of the Nationwide Building Society. Bournemouth is a busy seaside town with a lovely beach and some notable Victorian architecture. As you can imagine being a building society the site is in constant use during the day with customers and staff coming and going. The work would therefore have to be done overnight in stages working in different areas every evening until complete. 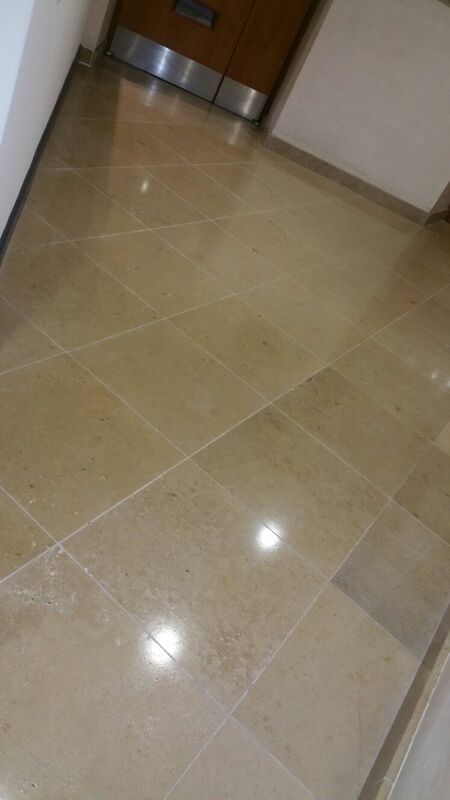 The floor was Travertine which is a very durable stone and ideal in heavy traffic areas such as this, but it needs to be protected with a sealer to prevent dirt becoming ingrained in the pores of the stone. 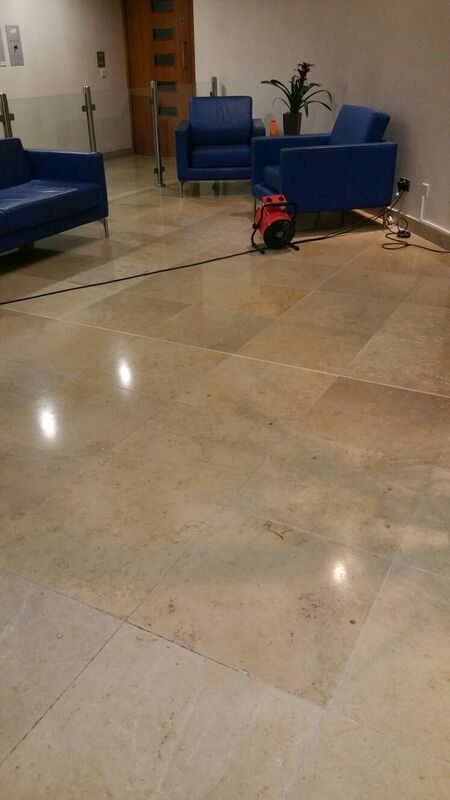 Being such a busy commercial floor, the sealer gets a lot of wear so the floor needed polishing and then resealing to keep it looking good. 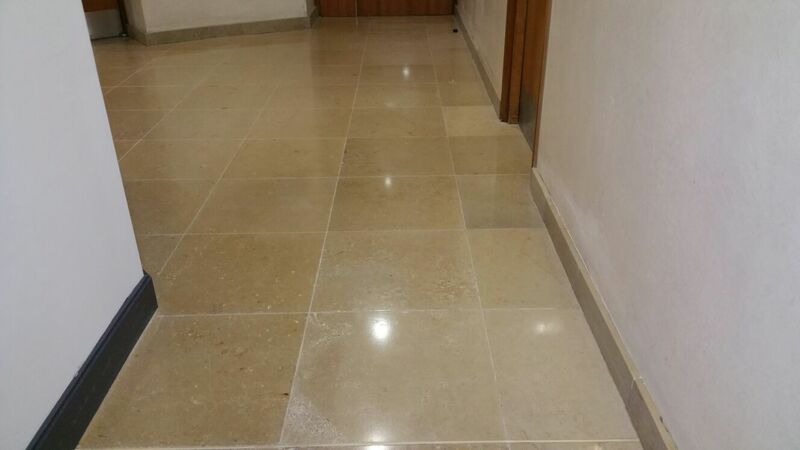 To get the floor clean and hone the stone to a polished appearance we use a set of Diamond impregnated burnishing pads which are run over the floor with a floor buffer. Tile Doctor do a set a of four which include 400, 800, 1500 and 3000 grit pads and are ideally suited for the purpose. The pads are applied with water for lubrication and in sequence starting with the coarse 400-grit, medium 800-grit and then fine 1500-grit pad. If you are familiar with grades of sandpaper used on wood, then you will appreciate that this is a similar kind of process. The floor is rinsed with more water in between each pad to remove the slurry that is generated and then extracted from the floor using a powerful wet vacuum. 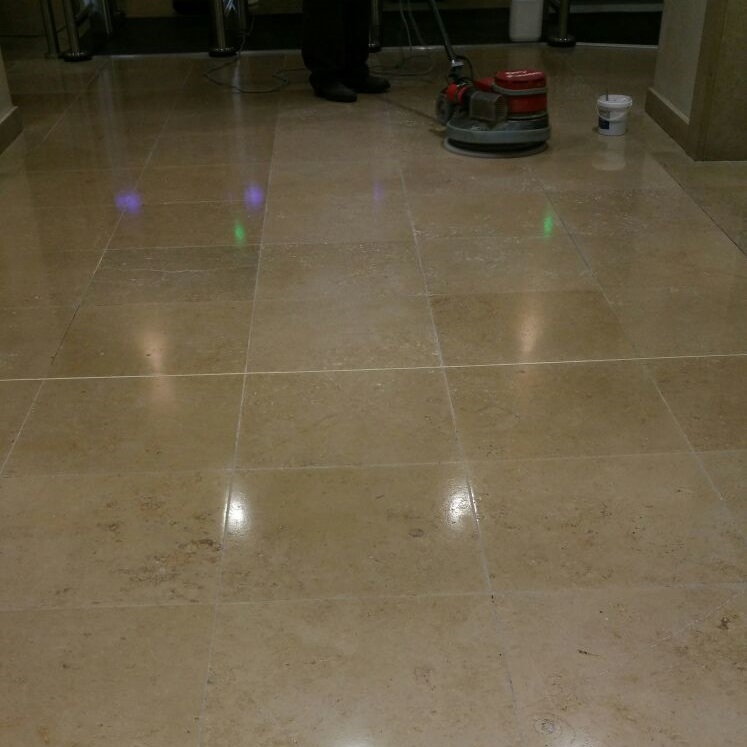 The last pad to be applied is the very fine 3000-grit which is applied with only a little water sprayed onto the tile and this really brings up a deep shine on the Travertine. 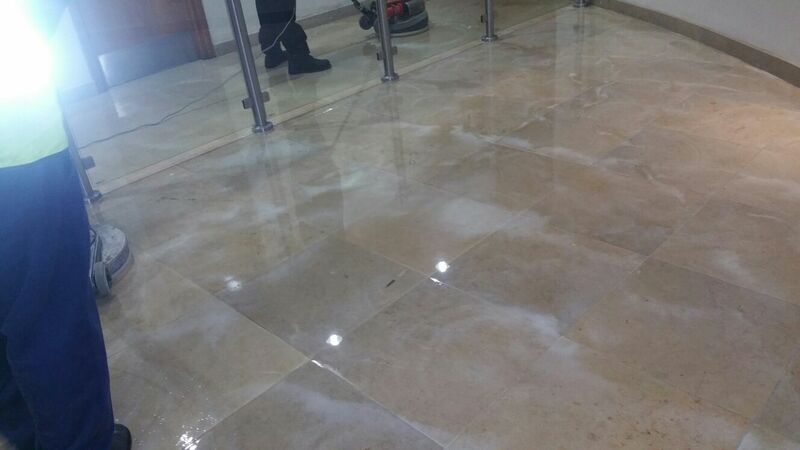 After the floor was dry, we applied two coats of Tile Doctor Colour Grow impregnating sealer that works from within by occupying the pores in the stone for maximum protection. Tile Doctor Colour Grow is also a colour intensifying sealer which provides durable surface protection, as well as enhancing the colour of the floor bringing out the natural tan and cream colours. Colour Grow is also a breathable sealer that allows moisture to rise through the floor however being a new building this would unlikely to be a factor. As you can see from the pictures the results were amazing and the client was very pleased! They commented how smoothly the process had gone and how accommodating we had been coming in overnight. Hopefully there are many more branches that may require our services! 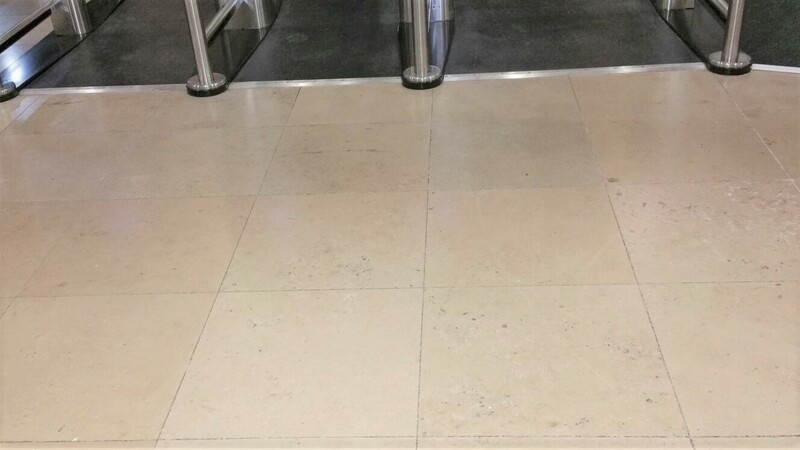 This entry was posted in Work History and tagged Bournemouth, Commercial Floor, Dorset, Nationwide Building Society, travertine cleaning, Travertine polishing, travertine tiled floor by AbzDominise. Bookmark the permalink.